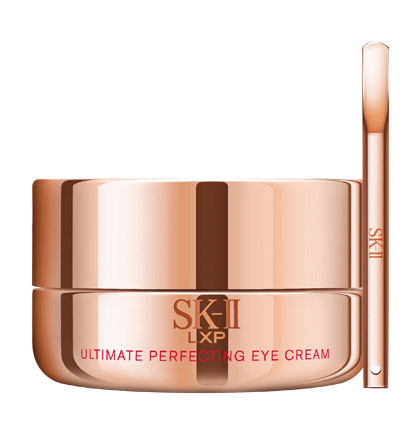 This deeply hydrating eye cream is enriched with SK-II’s Highest Concentrated Pitera™ to diminish the appearance of dark circles and discolorations, while also softening fine lines and wrinkles. The eye zone is nourished, firmer and brighter. Satiny soft and easily absorbed by the delicate skin around the eyes. Take a pea-sized amount using the spatula. Dot cream around eye area and spread evenly with your ring finger. Gently massage in a circular motion to enhance absorption. Apply every morning and night before a moisturizer, such as SK-II’s Ultimate Perfecting Cream. Other Ingredients: Water, Galactomyces Ferment Filtrate, Glycerin, Niacinamide, Isopropyl Isostearate, Isohexadecane, Butylene Glycol, Caprylic/Capric Triglyceride, Pentylene Glycol, Dimethicone, Stearyl Alcohol, Inositol, Petrolatum, Polyacrylamide, Cetyl Alcohol, Vinyl Dimethicone/Methicone Silsesquioxane Crosspolymer, Behenyl Alcohol, C13-14 Isoparaffin, Panthenol, Tocopheryl Acetate, Titanium Dioxide, Benzyl Alcohol, Polymethylsilsesquioxane, Dimethiconol, Methylparaben, Cetearyl Alcohol, Cetearyl Glucoside, Laureth-7, PEG-100 Stearate, Stearic Acid, Xanthan Gum, Disodium EDTA, Crithmum Maritimum Extract, Propylparaben, Ethylparaben, Palmaria Palmata Extract, Oryza Sativa (Rice) Bran Extract, PEG-7 Glyceryl Cocoate, Sodium Hydroxide, Fragrance, Polyquaternium-7, Litchi Chinensis Pericarp Extract, Saccharomyces Cerevisiae Extract, Palmitoyl Dipeptide-7, Methylsilanol Tri-PEG-8 Glyceryl Cocoate, Methicone, Hexapeptide-3, CI 77492.